Opening for Ms. Corringham, a first time duet: High Zero Collective member C.K. Barlow performs with long-time Baltimore pleasure-wizard Lexie Mountain. Also beneath this introduction, some further information about them. Thursday April 18th doors at 8:30, show at 9. The Red Room at Normal’s Books and Records 425 E31st Street, Baltimore, MD. Viv Corringham is a British singer and soundscape artist , currently based in New York. Her work includes performances, installations, radio works and soundwalks. Corringham’s preoccupation is with voicing the landscape and her project… offers an engaging glimpse of the emotional archaeology of a city. 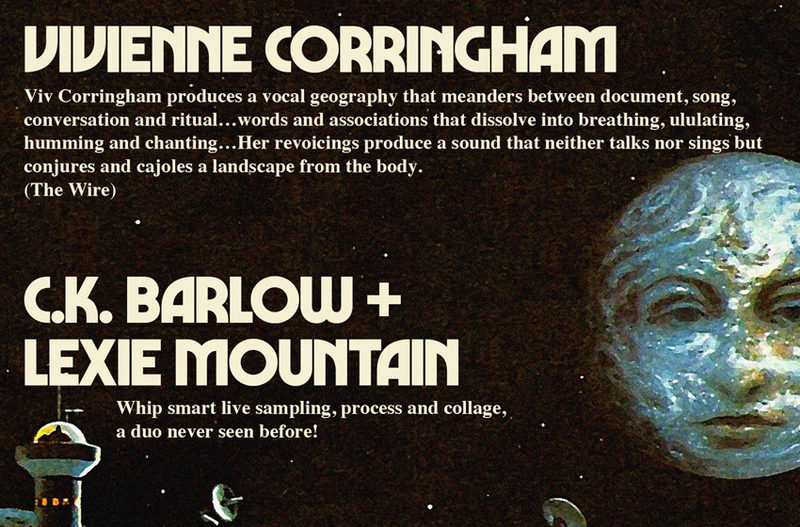 Corringham’s eerie, echoing mezzo-soprano takes on the force of an inner voice, infusing the spoken words with pungent emotion. The fragments of personal recollections and observations about Kingston become an otherworldly incantation evoking the mysterious power of memory, suggesting the collective traces left by those who’ve walked the waterfront before us. Corringham has an impressive mezzo soprano voice and uses electronic treatments and extended vocal techniques to good effect. Over the next several years performing as a soloist and on sampler/live sampling with Out of Context and mJane in and around New Mexico, I settled on a laptop rig centered on LiSa from STEIM plus a custom Max patch. Particularly with OOC, where I was live-sampling 10 or so other performers, each on his/her own input of my first-gen MOTU 828, I’d occasionally route through Live or MainStage for compression on the way in. Alexandra “Lexie Mountain” Macchi produces videos, sound work, textile projects, sculpture, drawings, paintings and things that refer to paintings. Her curatorial work has appeared at Floristree, School 33, Load of Fun Gallery and Hexagon Space. She is a freelance writer for Motherboard.tv, Baltimore City Paper, The Toast and Baltimore Sun’s Midnight Sun nightlife blog.As Lexie Mountain, Macchi has been an active contributor to Baltimore’s cultural scene for over a decade. 2004-2006 she programmed events, art shows, free festivals and music performances at various venues in the city. She is a founder and member of all-female experimental a capella collective Lexie Mountain Boys and avant-rock group Crazy Dreams Band, makes solo sounds under the name Lexie Mountain and collaborates regularly with a wide variety of performers and musicians in Baltimore and beyond.